Does this scene make you want to use this “protected” bike lane? Our latest #StreetFail comes from a Streetsblog reader who sent in these photos after a short walk from the bus stop to her office. In the two blocks between where the No. 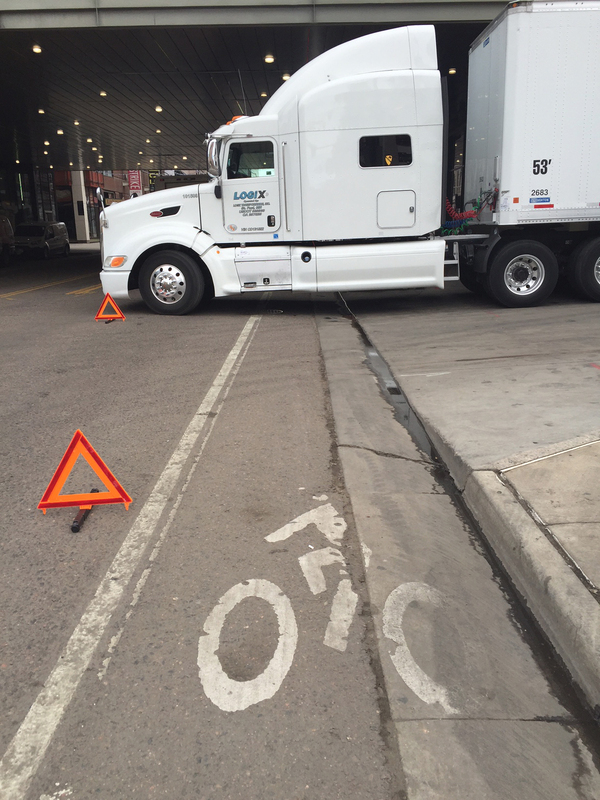 15 drops her off and where she works, she witnessed trucks blocking bikeways three separate times — once in the 15th Street protected bike lane and twice on Glenarm’s painted bike lane. Anyone who walks or rides in this area knows that these photos are not an anomaly — they’re capturing what happens every day. Here, follow these hazard signs into oncoming traffic. And don’t even think about walking on this side of the street. 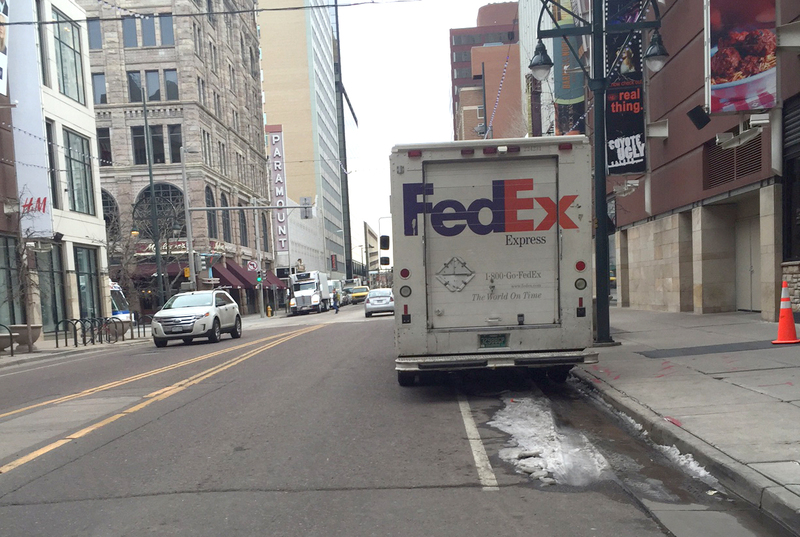 It’s illegal to park in bike lanes, but some truck drivers get special privileges when making deliveries because of a loophole that allows them to ignore “no parking signs.” When the city accommodates drivers who insist on parking right in front of their destination, people on bikes get forced recklessly into traffic, rendering the bike lanes ineffective. Enforcement is anything but strict, with the Denver Police Department and Denver Public Works pointing fingers at each other. The Hancock administration wants to double biking and walking by 2020, to 15 percent of all trips. That will take comfortable bike facilities that make biking appealing for everyone, regardless of age or ability. Denver won’t get there if it continues to let illegal parking undercut its own investments in bike infrastructure. When Hancock committed to ending traffic deaths and serious injuries, the police department committed to upping its enforcement of speeding, DUIs, and distracted driving. Stricter enforcement of drivers who act as barricades to biking should be a priority too. Why even spend the money to paint a bike lane? Yeah this happens all the time downtown. These lanes aren’t really “protected” if trucks and cars can drive/park in them. As frustrating as it is, there are no loading zones downtown (unlike in other cities) so where is the FedEx guy supposed to park to make his delivery? One of the worst offenders is actually the Denver City Building off 15th. 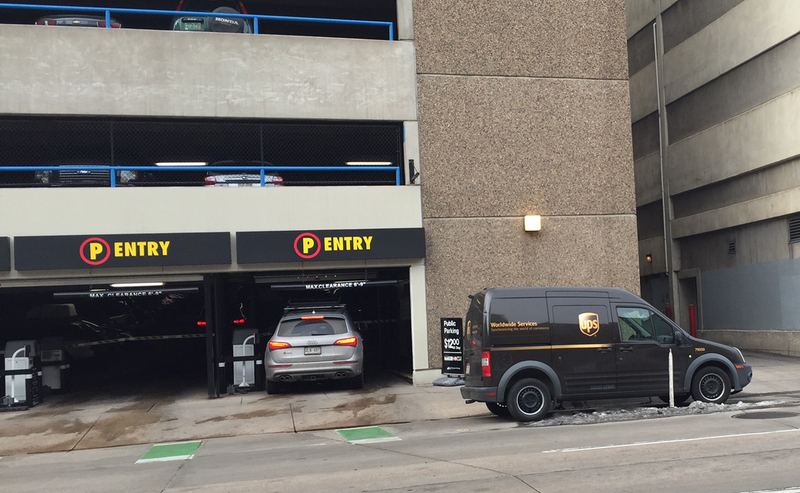 Deliveries for that building regularly block the bike lane for deliveries despite a loading dock being present.